Let’s say you’re besieged by a bunch of Orcs and Nazgûl in some fictional city in the realm of Gondor. And let’s say your ancient allies from far away in the land of Rohan are your only faint hope for rescue. How might you call out for help over such a great distance, especially with a bunch of mountains between you and Rohan? You would ignite a large pile of firewood that has been waiting ready at the top of a tower for just such a purpose. And many miles away, on the top of the nearest mountain, a beacon-warden would notice this fire and light one of his own. And then the warden on the next mountain over would do the same thing, and so on, until seven mountains later, your friends saw the fire nearest them and got the message. Tolkien mentioned this event only in passing on the opening page of his book The Return of the King, but Peter Jackson made it into a dramatic scene in his Oscar-winning 2003 film version of the story. It was a moving and visually stunning portrayal of a desperate plea for aid that, given the circumstances and technological resources available, could not have been conveyed in any other way. And if you understand this long-distance visual method of relaying information, you’ve grasped the basics of the optical telegraph, which predated the more commonly known electric telegraph by decades. In the early 1790s, French inventor Claude Chappe and his brother Ignace were trying to develop a reliable means of high-speed, long-distance communication. Their first attempt was clever but misguided. Each station had a large mechanism based on a pendulum clock, but in place of a regular clock face was a dial with 10 sections, corresponding to the 10 numerals. The clocks were carefully synchronized, being set in motion at the same time by way of a prearranged signal. The sender waited until his clock was pointing at a specific numeral and then made a sound; the receiver, whose clock would at that moment be pointing at the same symbol, thus knew what number was being signaled. Sequences of numbers corresponded to letters and words—and so, after a fashion, any message could be transmitted. But it was slow, noisy, and limited by the range of hearing, wind direction, and so on—clearly in need of an upgrade or two. Their next attempt, which continued to rely on the synchronized clock mechanism, replaced the sound with a movable panel painted white on one side and black on the other side. This gave them much greater range (with the help of a telescope) and, of course, quiet operation. But it then dawned on them that they could send much more information in a shorter period of time if they ditched the clock and instead constructed a mechanism capable of displaying a variety of visual signals directly. So they created a large apparatus with five panels; each combination of black and white panels stood for a different character. That worked better, but more innovations were soon to come. After another year or so of experimentation, the Chappe brothers determined that long wooden beams placed at various angles could be seen more clearly over long distances than black and white rectangles. So they created a simple mechanical device that could reposition two large arms (each with two segments—a main bar and a crossbar) into any of nearly 200 configurations; anyone with a code book could translate those signals into words and numbers. 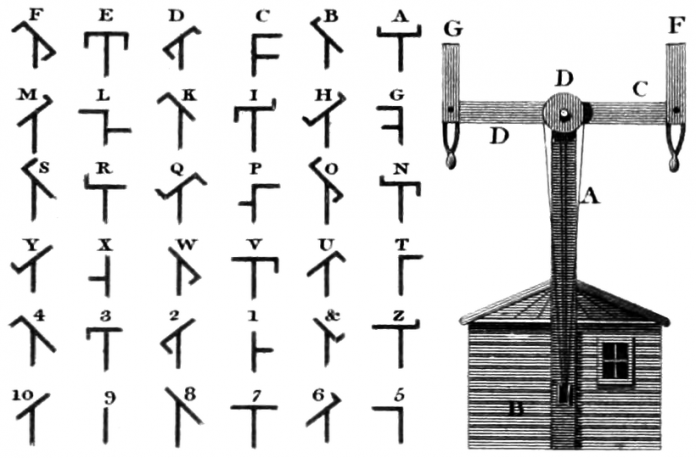 They dubbed their invention the “telegraph,” though nowadays all the early visual transmission systems are referred to as optical telegraphs, and this particular version is called a semaphore telegraph. The first major semaphore line, which stretched between Paris and Lille, 120 miles (about 190km) north, near the border of Belgium, began operation in 1794. It consisted of 15 stations, each of which could receive and relay a single character in well under a minute. I can just imagine a guy sitting there in a tower, patiently peering through a telescope, and then, suddenly: “Yo, François, it looks like an A!” And François would go orient the mechanism to display an A to the next station while his buddy watched for the next letter. A single character could be passed all the way down the line in this manner in as little as 9 minutes, and an entire (very brief) message in about a half hour. Before long, optical telegraph lines were installed all over France. When Napoleon came to power in 1799, he immediately began using the semaphore telegraph to relay tactical information to and from his troops. This system remained the primary means of telecommunication in the country for several decades. In fact, around 1840, after Samuel Morse had successfully proven his electric telegraph design, the French government initially declined to replace their semaphore telegraphs with the new technology. Despite its reduced need for human labor and its availability in poor weather or after dark, the electric telegraph was thought to be easily sabotaged—someone could simply cut the wire. The naysayers finally came to their senses and agreed to electric telegraphs in 1846, though some optical telegraphs were still in operation as late as 1881. The use of the word “semaphore” to refer to signals made with hand-held flags, typically for naval communications, came well after (and was inspired by) the semaphore telegraph. Thus, in a manner of speaking, the technology developed by Chappe and Edelcrantz is still in use—at least occasionally. Your wireless internet connection may be faster, but it doesn’t provide nearly as much exercise. Note: This is an updated version of an article that originally appeared on Interesting Thing of the Day on April 22, 2005.